Seven weeks after elections which spelled disaster for Sweden’s traditional parties and saw the right-wing anti-immigrant Sweden Democrats take nearly 20% of the vote, no new government has been formed. Predictably, it had been up to Mr. Ulf Kristersson (pictured right), the leader of Sweden's conservative Moderate Party to try and form a coalition but some within his center-right bloc refused to speak to the Sweden Democrats and thus he gave up as of this morning again, making new elections a possibility. As per the Swedish constitution, four attempts to form a coalition are allowed after voters go to the polls, otherwise, Sweden heads to another election (which could see the rightwing Sweden Democrats make further gains). Related coverage: <a href="https://thegoldwater.com/news/37927-Sweden-First-Time-Ever-As-Parliament-Dismisses-Leftwing-Pro-EU-Prime-Minister-L-fven"> Sweden - 'First Time Ever' As Parliament Dismisses Leftwing Pro-EU Prime Minister Löfven</a>. Would-be Prime Minister Mr. Ulf Kristersson said: "I have done what I can, for now," before throwing in the towel. The Scandinavian nation's September 9 election left both the center-right alliance of four parties and the center-left bloc both short of majorities in Sweden's 349-seat parliament, as the event many feared took place and the anti-immigrant Sweden Democrats took 62 seats. 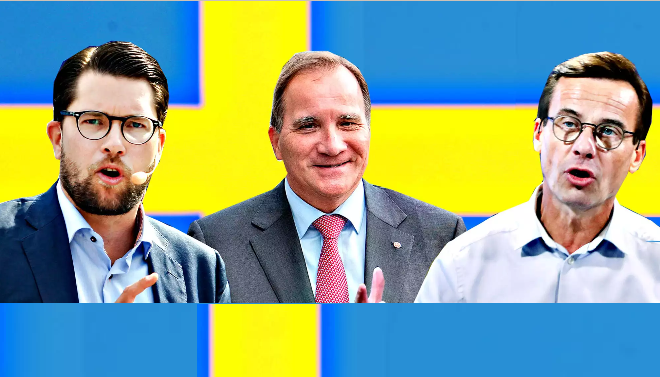 The leader of the Sweden Democrats, Mr. Jimmie Akesson (pictured left) stated on Sunday: "Either a party is willing to talk to us or we will head for another election." It is true that there are as from now only three logic solutions left. Either one of the blocs agrees to cooperate with the Sweden Democrats, either they form a grand coalition against that party or they organize new elections. In any case, all polls taken since election night indicate that new elections would only see Mr. Akesson gain more votes. Sweden's September 2018 focused on issues of housing, health care and welfare services, and Europe's 2015 migrant crisis. Mr. Stefan Lofven, the former Prime Minister (pictured middle) was ousted after a no-confidence vote in parliament (see our related coverage). Go to another election! Don't cuck.